"Catching them at this tempo, we risk losing our entire Orca population. The capture quota is now 13 animals a year, but no one is taking into account that at least one Orca is killed for everyone that is caught." Whale and Dolphin ConservatoryA still taken from drone footage of the “whale jail” on Russia’s Pacific coast. More than 100 whales have been ripped away from their wild habitats and locked inside cramped holding pens in Russia. The animals are being kept in what local media outlets are calling a “whale jail” off Russia’s Pacific east coast near the city of Nakhodka, according to The Telegraph. The 11 orcas and 90 beluga whales are possibly being held in their cages illegally and prosecutors have opened an investigation to find out the truth. This “whale jail” contains the largest number of marine mammals to be held in this manner, local newspaper Novaya Gazeta reported. 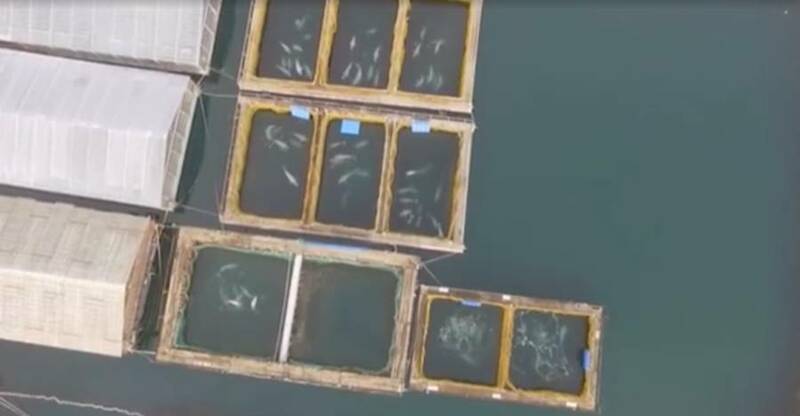 And because the enclosures are so small, prosecutors believe that most of the whales trapped inside are infants. Animal rights activists fear that the captive whales are being sold illegally to Chinese water parks and aquariums. Killer whales are a hot commodity in the ocean theme park industry in China. There are more than 60 marine parks in the country with many more being built. A single orca whale can reportedly sell for more than $6 million. A 1982 worldwide ban on commercial whale hunting made it illegal to capture whales from the wild for anything other than educational or scientific purposes, according to The Telegraph. Four companies are currently renting the pens off Russia’s coast and between them, they have exported 13 orcas to China between 2013 and 2016, an investigation by Novaya Gazeta revealed. In early Nov. 2018, local media captured a crane moving a whale from the enclosure and into a tank on shore, raising suspicions that the whales were being transported to an unknown location. 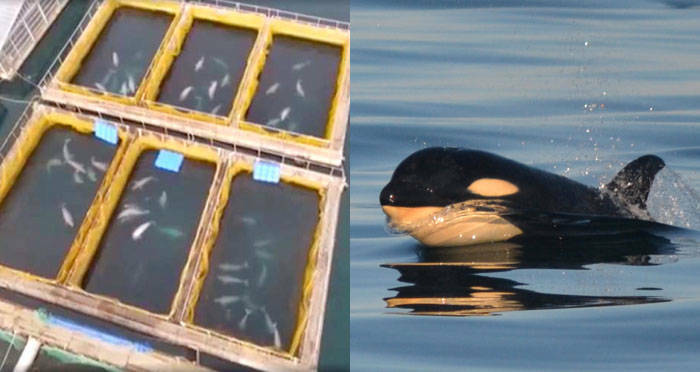 Footage of whales being transported from their enclosures to a tank on shore. Those same companies claim to have been given permission to catch 13 more orcas this year but the prosecutor investigating the “whale jail” is looking into the documents to find out if the whales were captured for scientific or educational purposes or if they were seized with an illegal endgame in mind. The companies were also reportedly “renting” out the whales as a way to get around the laws banning them from being sold for commercial reasons. Activists fear that this potentially illegal whale market will wreak havoc on already dwindling populations. 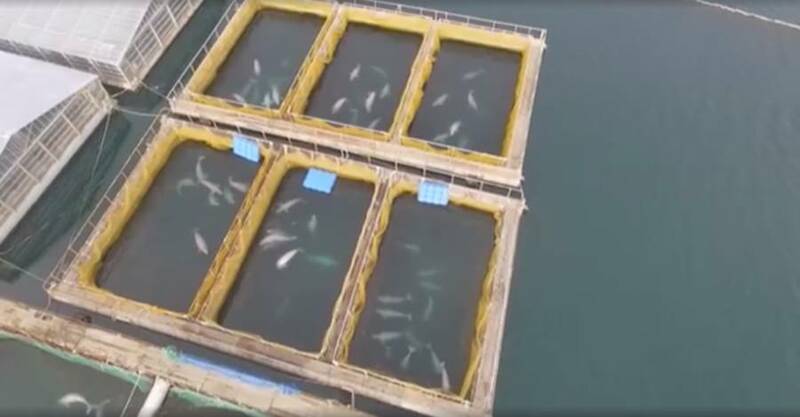 Greenpeace Russia also added that keeping the whales locked up in tiny, overcrowded enclosures like the ones at Nakhodka is “torture.” Whale populations across the world have taken massive hits over the last few decades and “whale jails” such as this are making matters even worse. Next, learn all about ambergris, the whale vomit that some people will pay top dollar for. Then, read up on the bizarre whale/dolphin hybrid known as the wholphin.